.... Good morning! Today's the day! It's Release Day for the new Uniko sets. I finally got my actual stamps Thursday afternoon, so I spent yesterday making cards - lots and lots of cards!! It was so nice to be able to try out different techniques. 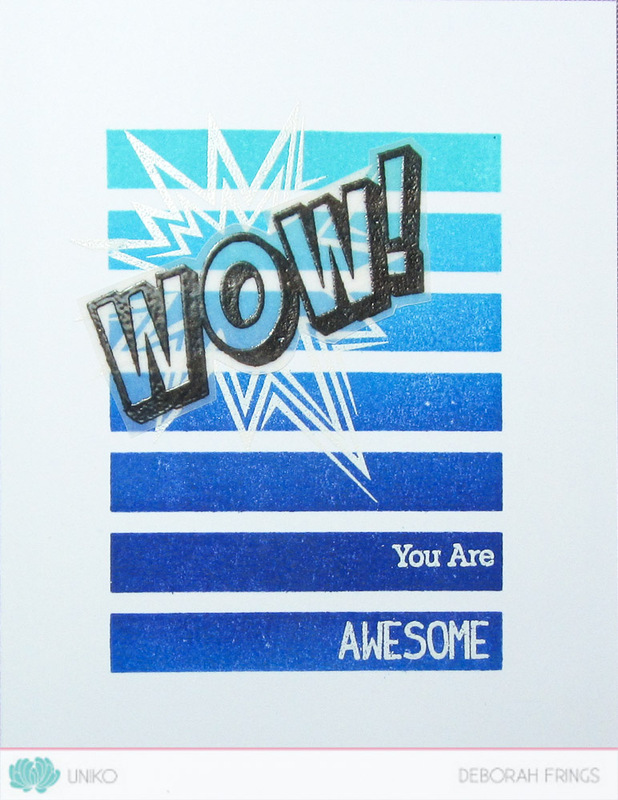 I also used it as an opportunity to play with my new Distress Oxides inks - they're fab! I cut a panel of water colour card to size and added colour with Distress Oxide inks. I added some ink to my craft mat, spritzed with water and dipped the card in. I dried the ink between layers and built up this lovely warm background of colour. 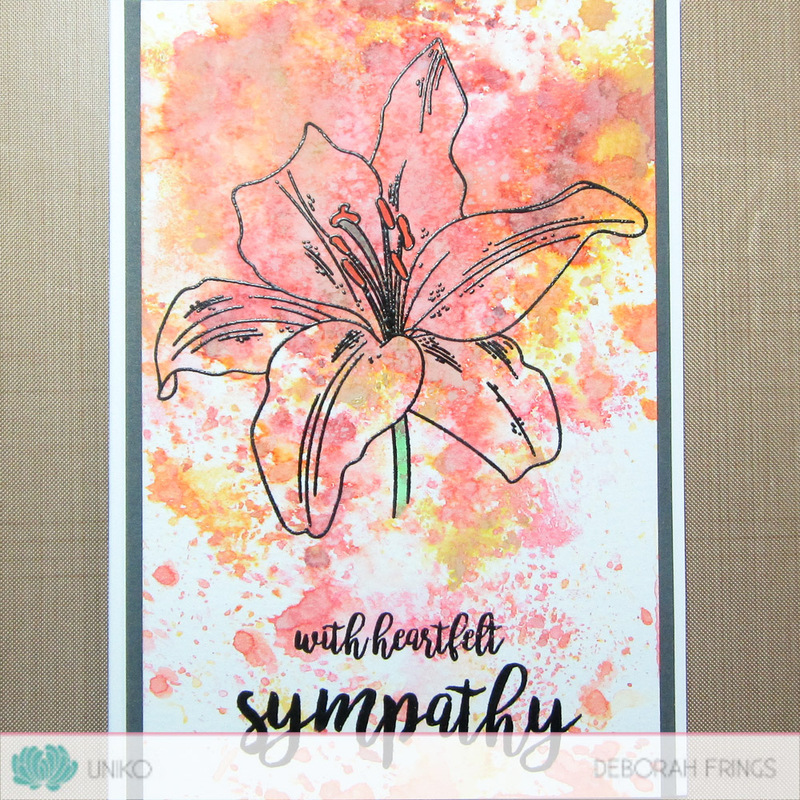 I stamped the large lily with Versafine black ink and heat embossed it with clear powder. 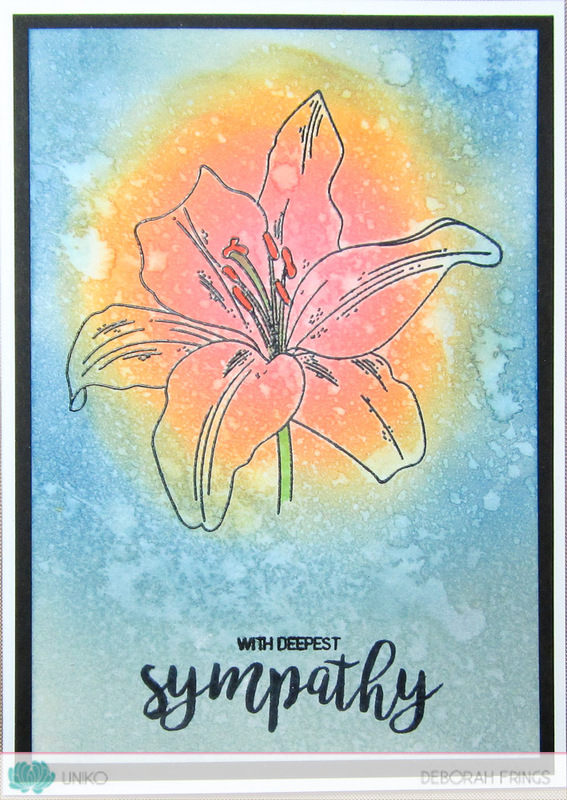 I added a touch of colour to the lily with Copic markers. 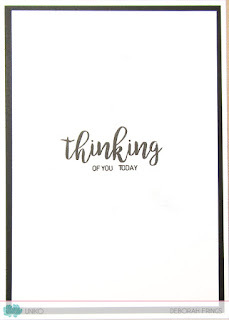 I added a sentiment from the set and layered the finished panel on to dark grey card and attached it to the card. On the inside I cut a mat layer of dark grey card and on the white panel added another sentiment and a partial flower. 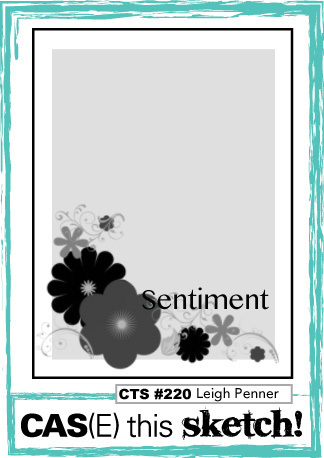 I'm submitting this card to TIME OUT Challenges - TOC#82 where they want to see flowers. I added ink to the water colour card with a sponge applicator and then spritzed the panel with water. I allowed the inks to blend a little and then dried them, spritzing from time to time to create a water droplet pattern. 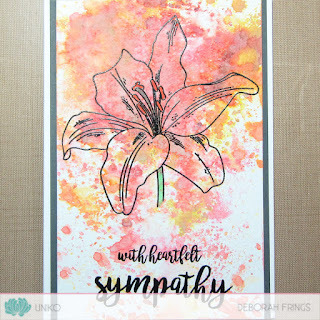 I stamped the lily and heat embossed with clear powder and finished the panel with a sentiment. I layered the panel on black card and attached the whole to the card base. On the inside I cut a mat layer of black card. On the white panel I stamped the lily in grey (second generation image) and added a sentiment on top. I used the sketch from CAS(E) this Sketch - CTS#220 for all the cards. For all the cards I stamped the succulent arrangement first in Distress Oxide, which I spritzed with water to allow the dye portion to wick out and then dried. Once completely dry I restamped the image in black. 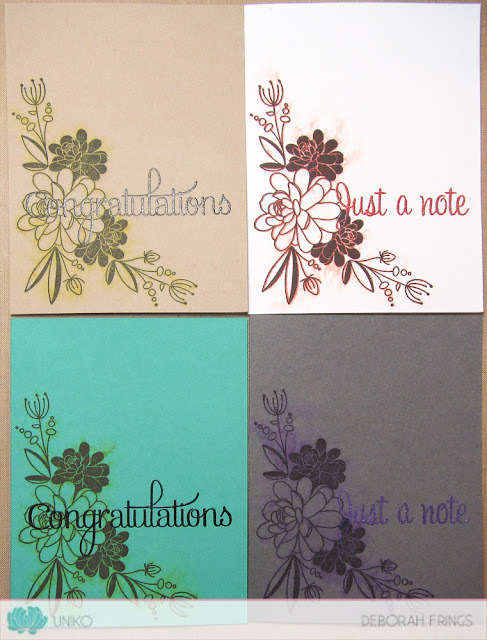 I stamped two of the cards with congratulations in black and heat embossed with clear powder. 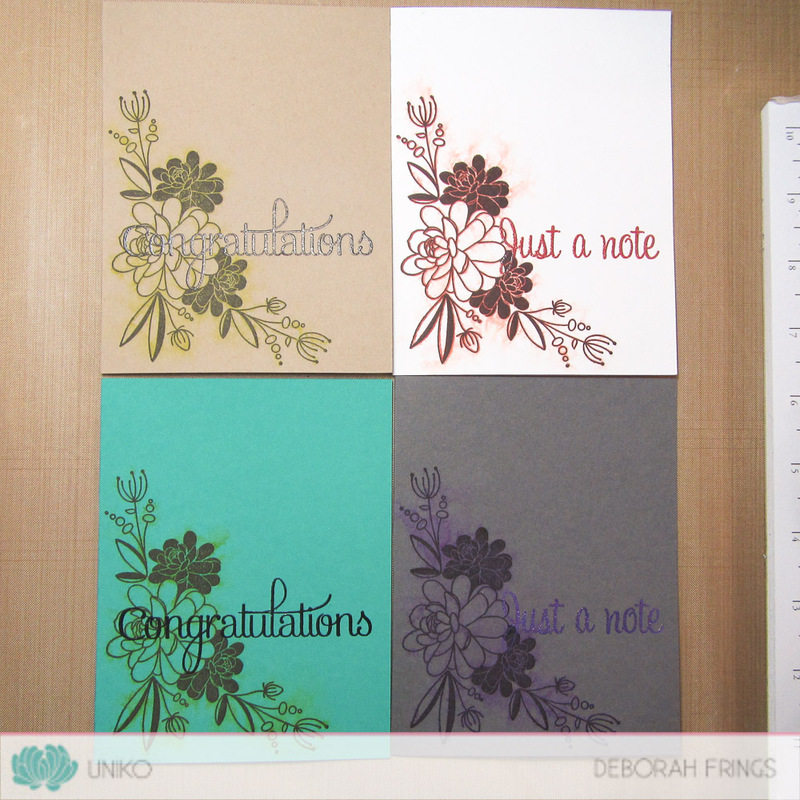 The other two cards have the greeting Just a Note which I stamped in Distress Oxide and embossed with clear powder. 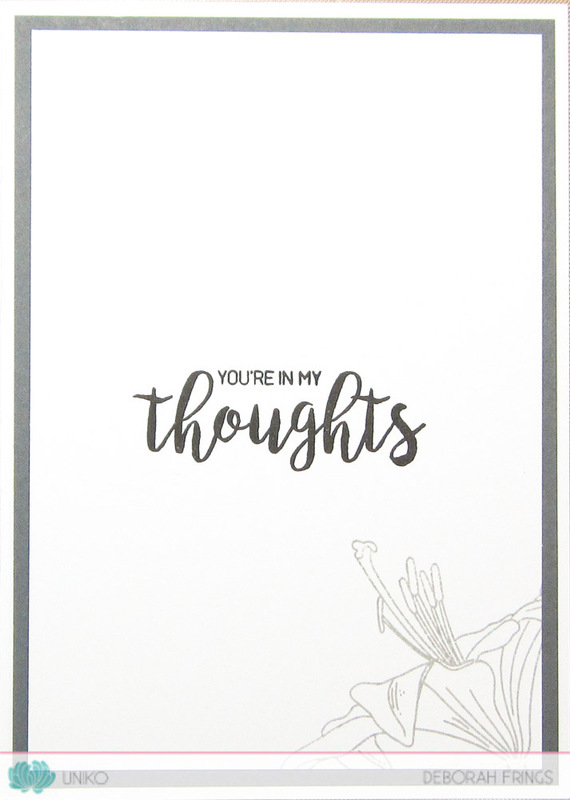 On the coloured cards I simply added a panel of white card on the inside with a simple greeting stamped to match the colour of distress on the front. For the white card I added a mat layer of design paper as well. This is a nice clean and simple card. I used my MISTI to stamp the stripes. I inked it up with an ombre ink pad going from orange to red - hot, bold and bright. I decided to add the lovely hibiscus flower as a simple outline in black to complement the hot colours. 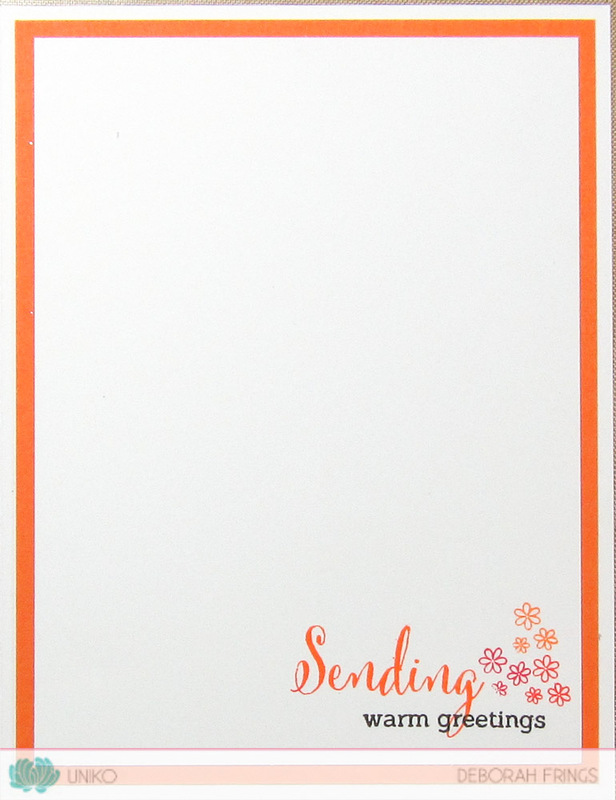 On the inside I cut a mat layer of orange card and on the white panel added a simple greeting. 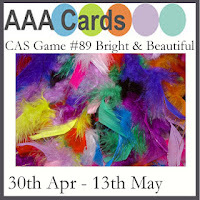 I'm submitting this card to AAA Cards - AAA#89 where they want to see a CAS card that's bright and beautiful. Once again I used an ombre pad - this time going top to bottom. 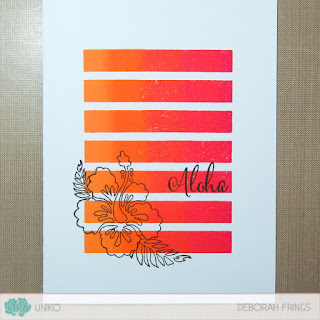 I stamped the words and starburst in Versamark and heat embossed with white powder. I stamped the large WOW on vellum and heat embossed with clear powder and adhered it flat to the card. On the inside I cut mat layer of turquoise card and added a simple greeting along with some smaller starbursts to the white panel. 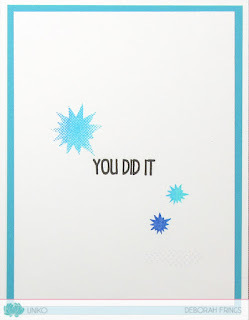 This is a really clean and simple card, but with lots of glitz and glamour. 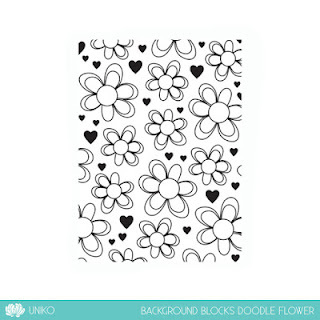 I stamped the flower panel in black and heat embossed it with clear powder. 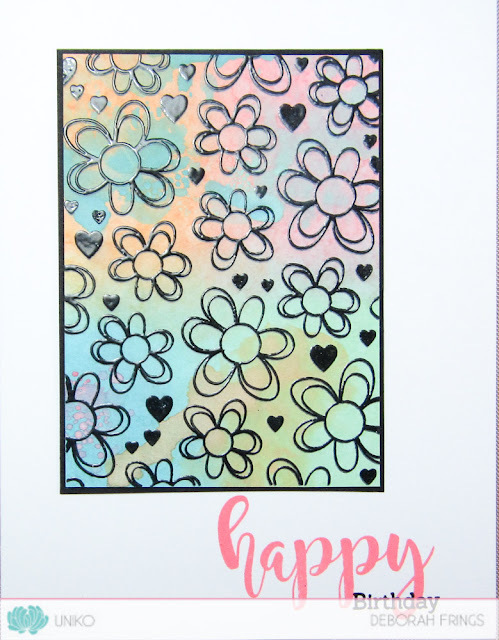 I used a quickie glue pen to fill in selected areas of the larger flowers and then added glitter. The card really shimmers and sparkles in the light. 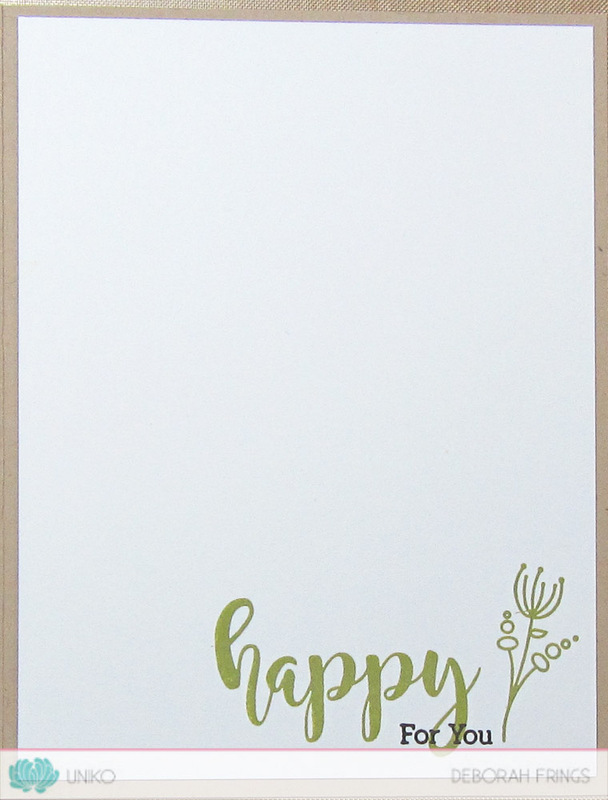 I added a hand drawn border around the panel and finished with a very simple birthday greeting. I'm submitting this card to CAS on Sunday - CASOS#107 where they want us to use glitter or sequins, and also to MUSE - MUSE#214 where I've picked the colours as my inspiration. I've made this for one of Kat's friends who's having a party today! Kat didn't want anything on the inside - just lots of space for her message. 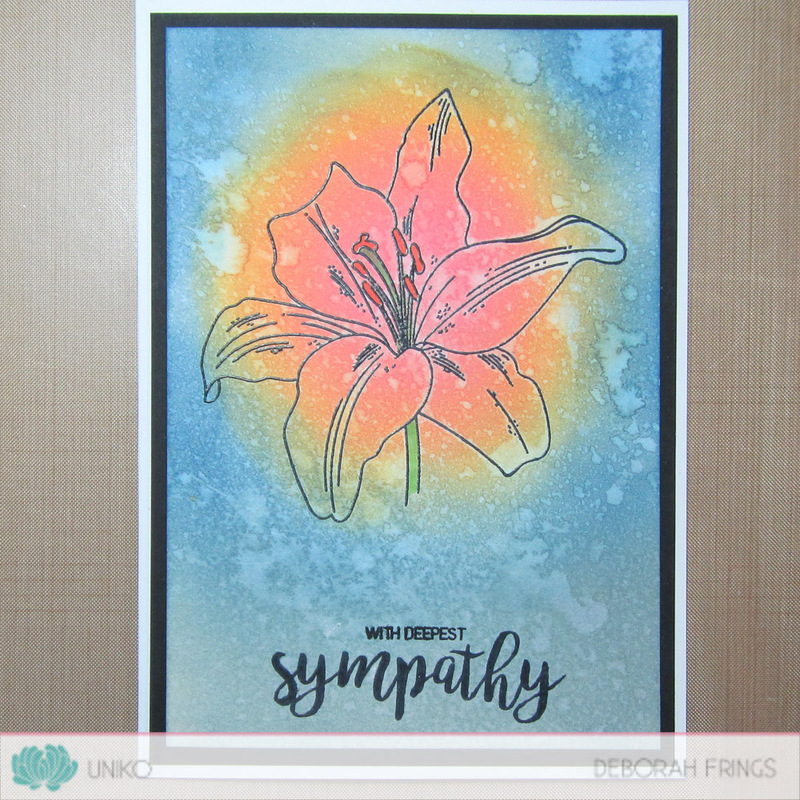 For my last card, I had another play with Distress oxide inks - I think they are just wonderful! One of the things that is really special about Distress Oxide inks is the way you can layer colours, instead of getting mud!! I love the way you can see the pink on the blue and the blue on the orange! It has a lovely soft look too. Once the panel was completely dry I stamped the flower image and heat embossed it with clear powder. I cut the panel to size and layered it on black card. 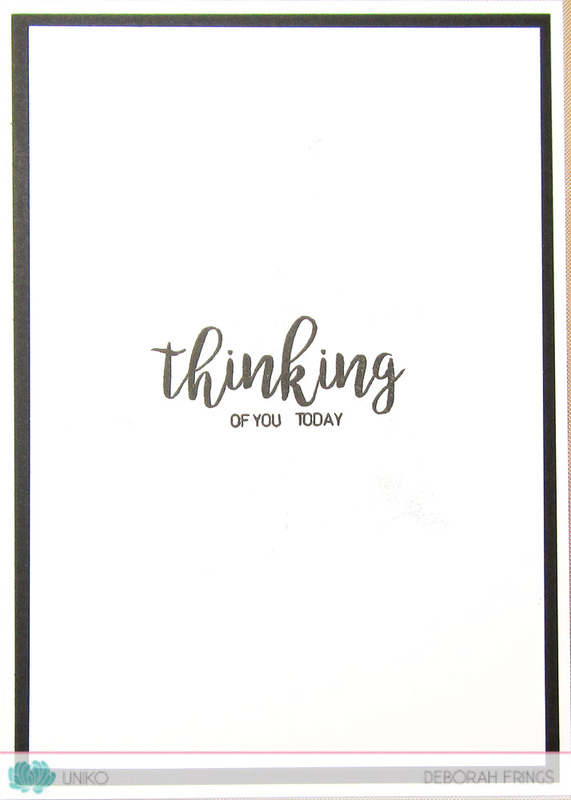 I attached it to the card off to the side and added a simple sentiment below the panel. The inside has not been completed as yet - I ran out of time!!! I'm submitting this card to Seize the Birthday where they want Anything Goes. 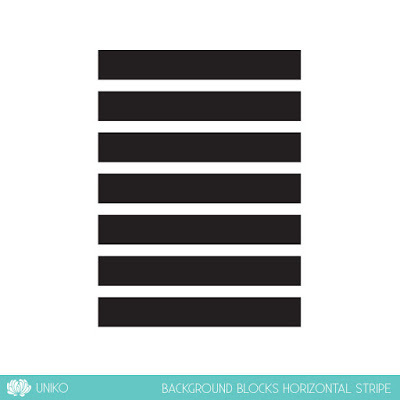 Now, as is tradition with Uniko Releases, there's a Design Team Blog Hop and a Giveaway. For your chance to win the ENTIRE release simply hop along the links below and leave a comment. A winner will be chosen at random from all those leaving comments by midnight (BST) Saturday 14th May. It's been a long post - thank you for sticking with me to the end. Not only is today the release of all these lovely sets, but Bev, and some of the Design Team, will be at Port Sunlight for the Happy Stampers Festival. I hope that they all have a fantastic day. Bye for now. Wow!! You have been so busy! What a gorgeous set of cards! I saw your set of four on CTS220 so wanted to come over and take a better look! Superb showcase Deborah! Love them all and your combinations of Uniko stamps are fabulous. Thanks for linking one up at AAA Cards. Wow! I need the whole release (thanks so much! lol!). 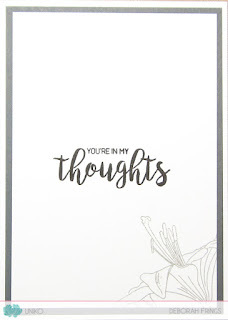 Love how you incorporated the Muse card inspiration - thanks for joining us this week! 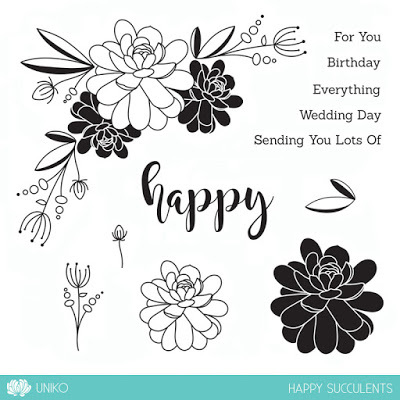 Swoon worthy cards! 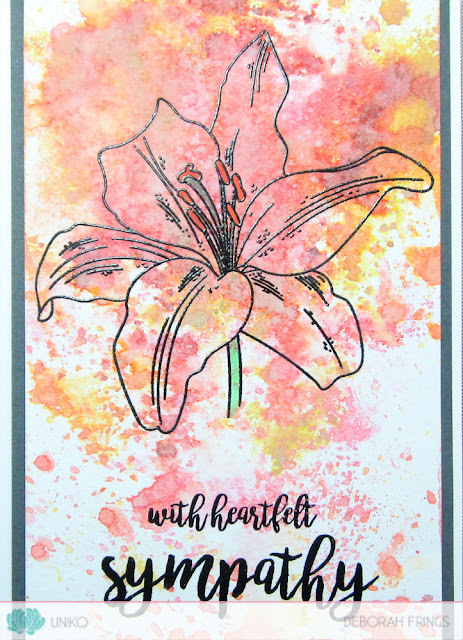 Those background you created for the pretty Lily stamp and the stripes are amazing!!!! Wow you have been busy! Such pretty cards! WOW! you have been a busy girl, all of them are FABULOUS, great design and colours. Lovely cards.. I love your CAS style! 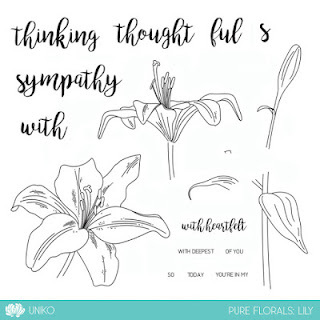 I adore your Lily cards, how you resisted the temptation to colour in the lillies but made them so serene using beautiful background colours,superb! I like all your cards, so many of them! Bravo! so pretty. (that's my favorite color). cards really make the cards look unique. Absolutely amazing Deborah!! Your colouring of the lilies took my breath away! Beautiful showcase with so many elegante cards! Your take on Anita's Muse card is fabulous. Love those pretty flowers. Ooops! Ps! Just realised you've shared your aloha beauty over at AAA cards which works brilliantly for bright and beautiful. Thanks for joining us this week. Thanks so much for the awesome inspiration with the new stamps. Your cards are wonderful. Such beautiful cards! 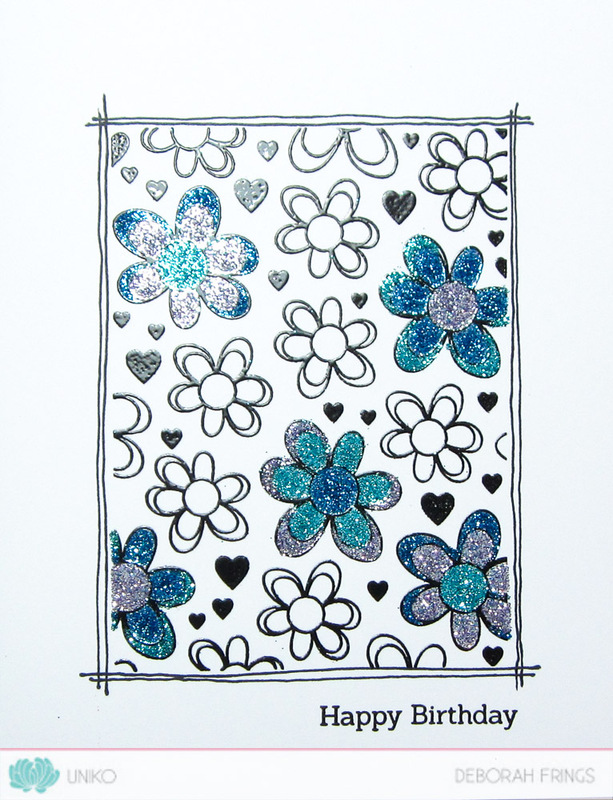 I love the glitter flower background and the embossing you have done! That lily stamp set needs to join my stash! Thank you for the inspiration! OMG Deborah ! 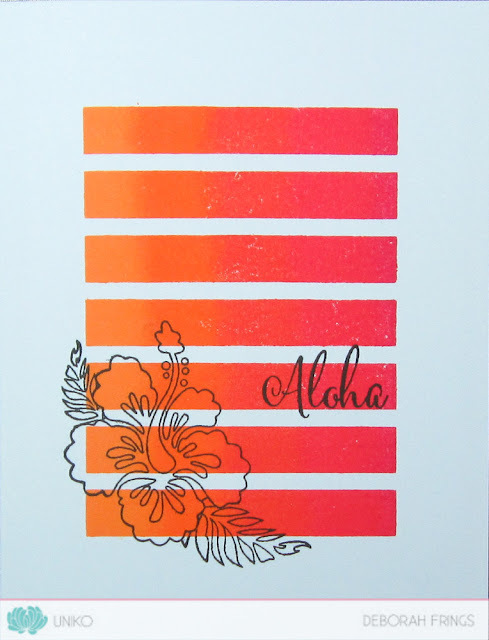 What a fantastic showcase of all the new release, you really impressed me !I love them all but I especially love the Aloha card with this gorgeous and bright striped background ! Thanks so much for sharing and for inspiring. GOSH! You have been on a mission my girl! these are all so wonderful and you have showcased these stamps and given us lots of inspiration on how to use them.Truly wonderful!...can't pick a favourite. Came back to let you know that I've just ordered the whole. darn. release. Thanks to you! lol! Go collect your commission cheque! Beautiful cards! 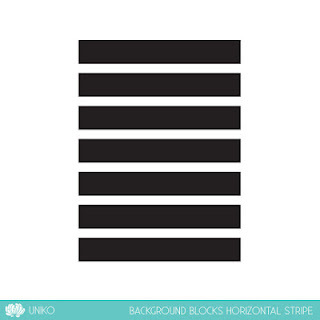 I really love that fabulous lily and the background stripes! Awesome release! 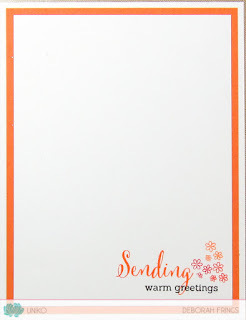 the color you used on the white card, so pretty. Wow, I really enjoyed your cards. 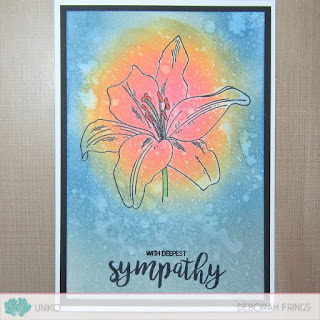 The background stripe with the ombré ink stood out to me as did the first card with he distress ink painted backgrounds. Really great cards! Lovely cards Debby. Love your use of the oxide inks. Thanks so much for sharing your birthday card with us at Seize the Birthday. 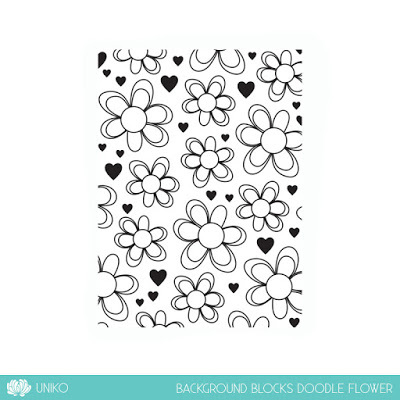 Looks like you fad such great fun using the new Uniko stamps! So much inspiration and beautiful stamping as always! Thank you for joining us at TIME OUT again! My goodness. You have been busy. Each and every card is an absolute masterpiece. Thanks so much for playing along at Time Out.